“Where’s your data?” You create it, you store it, hopefully, you’ve taken my advice and backed it up – yet I’ve found through my years of work with individuals, companies, and professionals – this question often remains. From e-mail storage, to pictures, to music, to important proposals, accounting files and databases, many USE their information on a daily basis, but ask them where it actually RESIDES on their digital devices or servers, and you’ll get a blank stare and a shoulder shrug. The most important component of their digital world is often a mystery. Without knowing WHERE it is, it is difficult to manage it. So what do YOU do? Your Tech Concierge™ advises that to manage your data, you must first establish a structure to organize your personally created files so that you can easily store and retrieve them. Knowing WHERE you store and place your files is the first step in the data management cycle. The “WHERE” includes the physical storage location which might be your local hard drive, a USB storage device, a Network Attached Storage device, a Server, or a Cloud storage host. In addition to the physical device, the location where you save your data on that device is important for easy access. That leads us to Step 2 of the cycle. Being diligent and systematic about where and how you store your data will help you quickly locate it when you need it, move it and transfer it as needed and also help you more effectively organize your backup strategies. This approach works on both Windows and Mac platforms as well as any storage medium. For the readers of this article, I’d very much appreciate the opportunity to answer your specific “Data Management” questions and help you with implementation concerns. Please send me your comments and I’ll be certain to post your remarks in a future article. 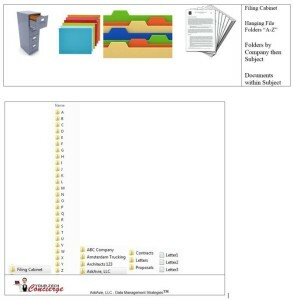 If you’d like to download the File Cabinet .zip file template that I use, Click Here and Save the the File Cabinet to your PC or Mac . Extract the .zip file in your documents directory or directory of choice and it’s ready to go! This is 17th in a series of aSKaVIE articles devoted to your productivity, digital privacy and protection. In future articles, you can look forward to tips and tricks that you can use to make sense out of your digital investments as well as reviews of new and exciting things that will likely provide value to your home and business. I invite you to write me with your questions and feedback. We’ll also be helping and inspiring others by answering your questions and that’s what makes my job so much fun! So stay tuned. Please send your questions to questions@askavie.com.